Is Aeroplan Down Right Now? @aeroplan Can't change password today - get "Default error message(SYS-ERR-CODE: UNDEFINED)"
@Aeroplan your website isn't working- I get an error message when I try to look at book travel> hotels ?! @Aeroplan booking tool seems to be down, cannot search and book via app or webpage. Thats a lot of aeroplan points!!!! @Aeroplan Is there a problem with your website? Can't cancel booking on line for two days now. Waiting forever on call centre hold. @Aeroplan Website not showing turkish flights. Is it a glitch? @ Aeroplan Happy Friday! Do not appear to be working. @Aeroplan Is your system down? 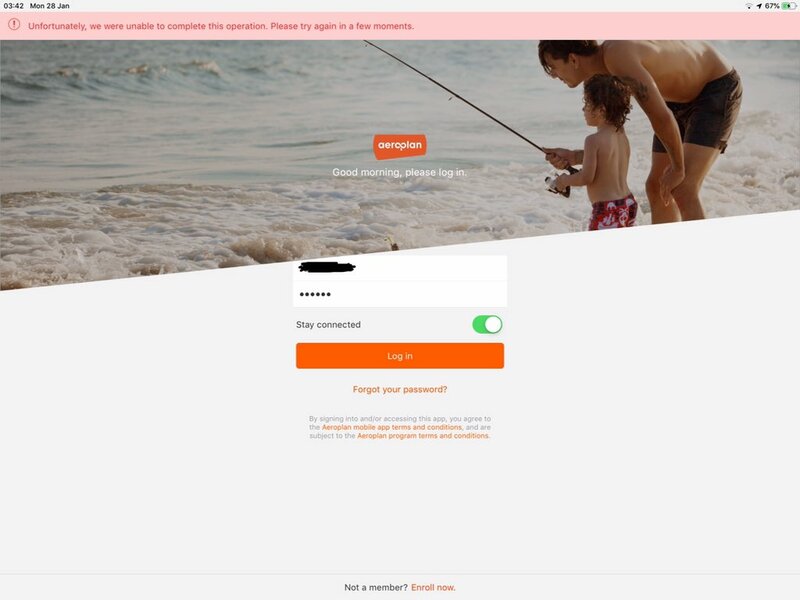 I cannot sign up for an account. Have tried several times. @Aeroplan your mobile app for android had not been working for over a week. Can you fix this so u can use it again. @Aeroplan Why can I not login to my aeroplan account? None of the links on your website are working. @Aeroplan just wondering why the app is no longer working. Have not been able to log on since Tuesday. @Aeroplan The Aeroplan E store seems to be down? @Aeroplan is your website / app down. Can't search for flights? @Aeroplan Your website is down - cannot book flight reward tickets - has been down since weekend! @Aeroplan the issue is resolved. my mistake. @Aeroplan Please fix your site. login or accessing Aeroplan account is not working.